Times have undoubtedly changed and there is no longer a need for a child to start riding a tricycle or move on to a bike with training wheels attached in order to learn proper bike balance. A specially designed balance bike – often called a glider bike, or pedal-less bike – makes teaching a young tot to ride a breeze. Toddlers as young as 18 months old can quickly learn to handle the two-wheeled balance bike. Most children achieve riding skill on the pedal-less bike in a relatively short time period. Many pick up the bike and start to immediately ride with no instructions required. Soon they are coasting and even jumping like a pro. Balance bikes first emerged in Europe over a decade ago where they have experienced widespread popularity. It is not uncommon to visit a family park in Paris, Amsterdam, or London and see a bevy of youngsters skillfully riding around on the pedal-less bikes. Recently the glider bike trend has started to take off in the United States and parents are beginning to encounter numerous brands of balance bikes at most retailers. Toddlers tend to learn to ride a balance bike with far fewer bumps and bruises than more traditional tricycles or bikes with training wheels. The balance bike typically becomes a natural extension of the child and requires very little coaching from the parent. Most children find riding a balance bike less terrifying because they can easily utilize their feet to seek comfort and bolster their self-confidence. As the child gains assurance on the balance bike, he will naturally become more daring. Parents can adjust the seat of a balance bike to accommodate their child’s specific body size. The seat’s adjustable height allows the child to sit completely on the seat with their tush while their feet are planted firmly on the ground. Having full control of his feet allows him to quickly push off, brake, slow down, and balance all with his soles. This gives the child a true sense of security and removes the scariness of a potential fall. Some balance bikes do not possess a brake, but a few brands are sold with brakes. Most bike shops can install brakes if the bike does not possess a pre-installed factory braking system. Ideally, the balance bike should come with an enclosed rear braking mechanism for complete safety. Children as young as 2-years old can quickly understand and grasp the concept of the bike’s brakes. Riding and maneuvering traditional bikes with training wheels and tricycles tends to take a great deal of energy. The child often becomes tired from taxing their legs riding up hills and across difficult terrain. Even their arms start to feel the strain of trying to lift or steer traditional bikes because they are about two to three times heavier than a balance bike. As all parents know, a tired child is a cranky child. Avoiding overexertion on any bike ride makes the entire experience far more pleasurable for everyone involved. The balance bike makes physical exertion a thing of the past. A child can easily coast and scoot over hills with relative ease. A family can enjoy longer bike rides without worrying about junior becoming tired. To start a child out on a balance bike, you should choose a flat location. Avoid hills during the first few outings. Once your child can ride on a flat surface, it’s time to tackle a hill or two. Toddlers who first start out their biking lives on a balance bike are normally able to transition to a modern two-wheel bike by the time they are four or five years old. 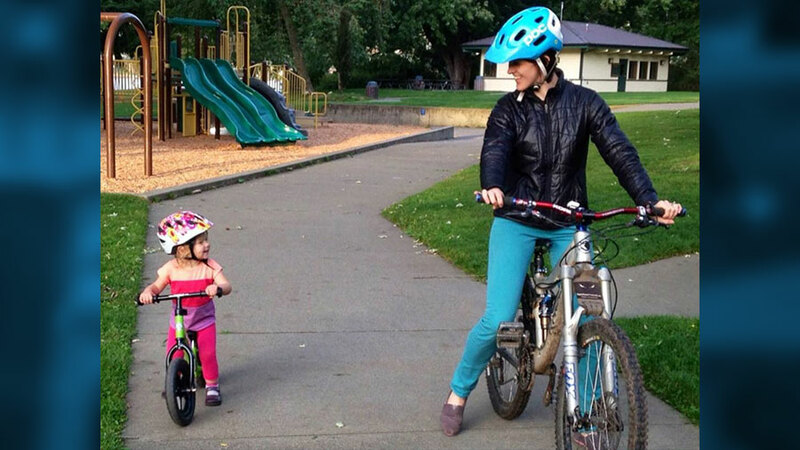 There is very little doubt that biking helps form a deep parent-child bond. It’s a classic activity that families enjoy together. Balance bikes allow the fun of biking to start early and continue for a lifetime.